One of my favorite artists Claire Nereim (interviewed here) just launched a tshirt line with her friend Julie Cloutier, called Stymie Apparel. 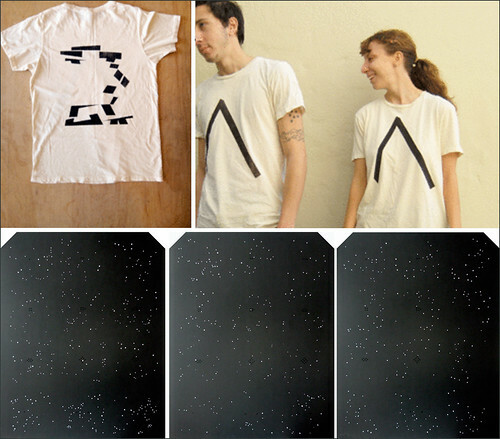 The first shirt in their collection, released yesterday, presents an A made from a Z and a Z made from an A, screenprinted front/back on super soft tees for guys and girls in white and cream. They are available in 3 sizes at STYMIE. There will be more styles coming soon but each style will be very limited edition. I’m loving them, get yours now! I think they go nicely with her star posters featured above. 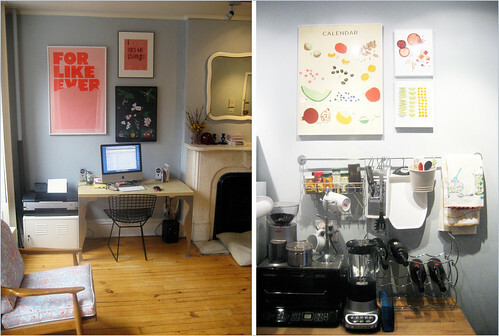 Here are some other Claire pieces in my apt (California Flowering Trees, and Fruits Calendar). **Also if you have not already, check out Yasmine’s amazing new magazine Parasol. Issue 2 is fabulous. If you missed issue 1 check that out also, I’m interviewed in it! Yay Yasmine. aw. thanks for the shout out sam. that’s your apartment?! i want to see the rest…especially the fireplace! and lols that for like ever poster. i’ve always liked it. i know, everyone has that poster but i love the colors to very much!! The fireplaces don’t work but there are two squeezed into the little 700 sq ft. place!!! awesome Dallas…hope he loves it! your apartment is lovely! I would love to see more as well 🙂 I like the pink poster that says “For like ever” where is it from? I’ve seen it in person at a friend’s house in brown too. Really nice.